The band who accompany the show, while dipping into the narrative at various points, fill the space with rock ‘n’ roll music as the audience take their seats, before ramping things up into a more interactive performance in the lead-up to the beginning. This music set-up is a real asset, and this talented group of actor-musicians, refereed to both within and outside of the narrative as Johnny and the Valentines, skilfully flit between centre of attention and subtle accompaniment so naturally that you barely notice it happening before your eyes. There are no clunky transitions here, and the way the music interacts with and supports the language and action is integral to the rhythm and flow of the piece. 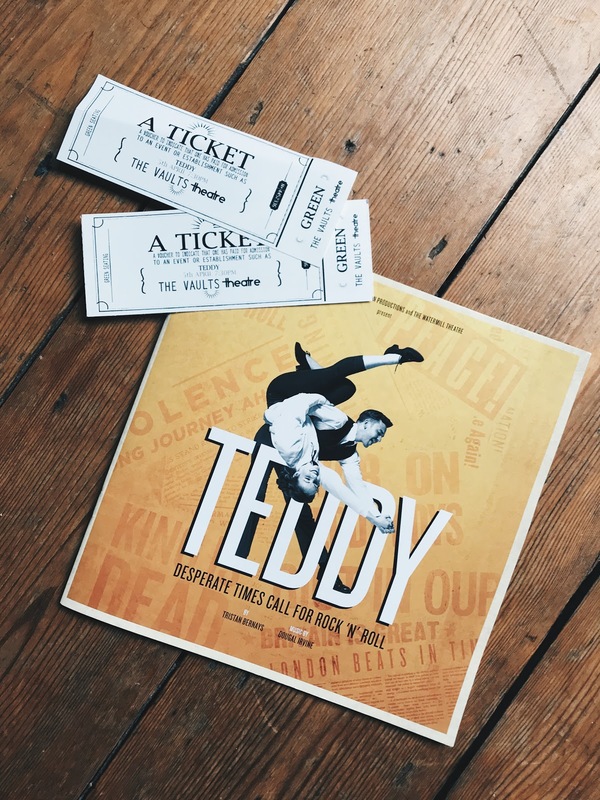 Objectively presenting the Teddy Boy or Ted culture, which stormed Britain in the 1950s, the show follows two young Teds as they embark on a night out with their respective friends. Through various events, the pair’s stories become intertwined, leading to events that will change their lives indelibly. Even before the two meet, the script is comprised of two overlapping monologues that feed into and cut over each other. While the phrasing of the dialogue is predominantly poetic, the language is quick and sharp, never feeling forced or flowery. The effect of this poetic current is a highly charged and rhythmic piece; the pace doesn’t falter or slow for a second. Though the script is beautifully crafted, huge credit must go to the direction and performers to carry the poetic nature with such conviction and naturally conversational delivery, perfectly accentuating the rhythm in all the right places. For the majority of the first act, the plot is fairly understated, with focus set on the captivating linguistic prowess, depth of character and their rich portrayal. Though the second act reaches slightly less credible dramatic heights, the naturalistic rhythmic and poetic qualities remain, the allure and innovation of which allow you to forgive the spiralling narrative. Teddy is playing at The Vaults until 2nd June. I was gifted this ticket in exchange for a review, but all words and opinions are my own.